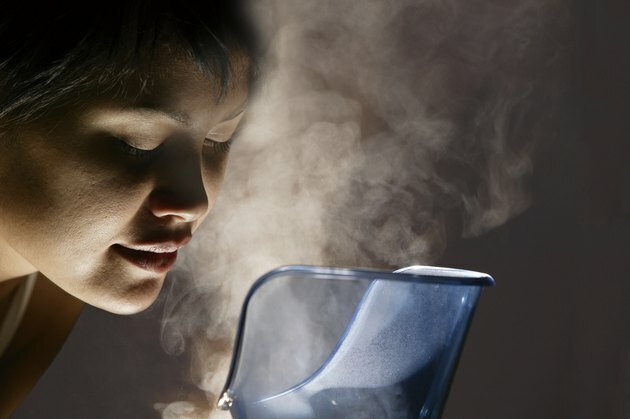 Regularly applying warm steam to the face is a truly beneficial beauty treatment available to anyone. Whether applied during a professional facial in a spa or at home under a tented bath towel, facial steam applications give you multiple skin health and beauty benefits. While pores do not really “open and close” -- they have no muscles around the pore opening to accomplish this feat -- facial steam does increase perspiration, and this has a cleansing effect on skin. Perspiration is about 99 percent water, according to the Department of Physiology at Indiana University’s Medical School. When perspiration flows from the skin, it lifts dirt, dead skin cells and other debris that may be trapped in pores to the surface of skin, where it can easily be removed. Visible skin is dead skin; to produce new skin, cells divide in a process called mitosis. When they are new, skin cells are plump and firm. Over time, these cells migrate up through the layers of skin and undergo profound physiological changes. By the time they reach the uppermost layer of skin, the cells are flat, hard and dead. They are bound to each other and to the living tissue below via a type of cellular cement. These dead skin cells provide a protective barrier function for the body to keep environmental, bacterial, fungal and viral aggressors from entering and to keep too much moisture from escaping. In youth, cellular turnover takes, on average, 28 days. As people age, however, they do not shed the dead cells as quickly, and skin begins to look old, depleted and tired. Steam helps loosen the cellular cement that binds too many dead skin cells to the surface of skin. After a facial steam, skin appears fresher and younger-looking. What Are the Benefits of a Facial Sauna?